Chicken – there’s nothing else like it. It’s a blank canvas waiting for you to transform it into whatever you can imagine. They say a cook is measured by their roast chicken. I don’t know if that’s true but it is a good thing to know how to do. 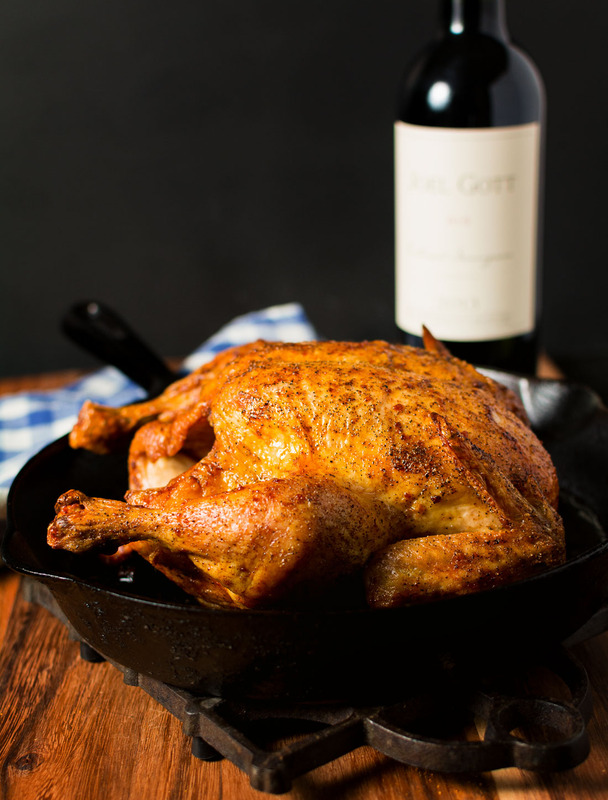 Back in the sixties, Julia Child first showed us how to roast a chicken on the French Chef. I sometimes wonder what life would be like if she hadn’t come along. Would we all still be eating jello with marshmallows in it? 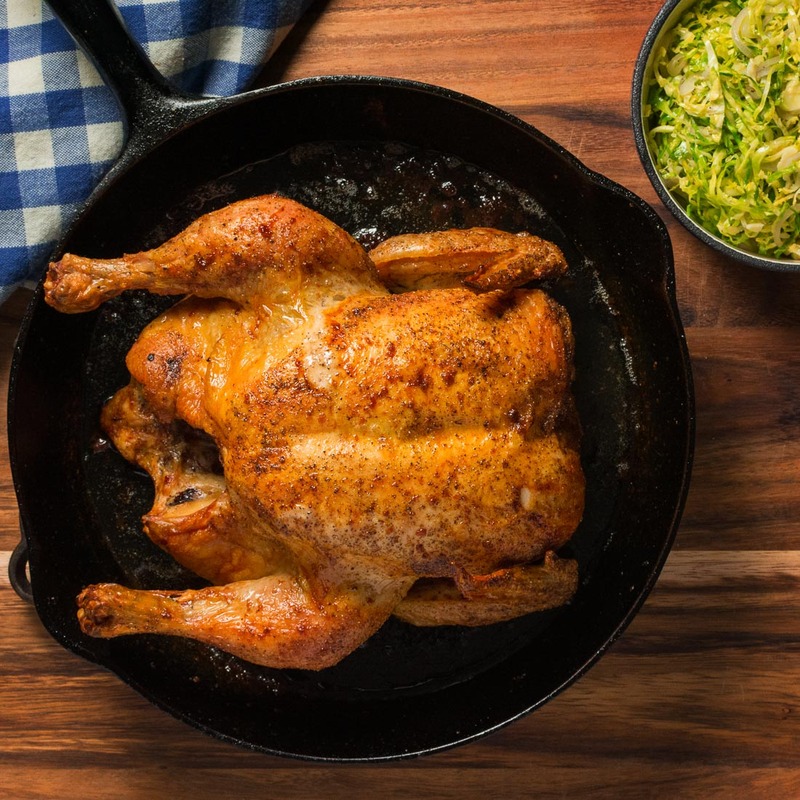 The most important thing to consider when roasting a chicken is… the chicken. Aiir chilled, grain fed bird at a minimum. They are easy to come by these days. Why waste the time and effort only to be disappointed by the water laden, flavourless no name bird? Next is oven temperature. This isn’t a baked bird – it’s roasted. Set your oven to roast. 400F is roasting. This recipe works well with a fryer (3-4lbs) or a smaller roaster. For a bigger bird you should consider dropping the temperature to 375F. Some of the concentrated chicken stock will bring it up to something special. This is not essential but it does kick it up a notch. Anything powdered and electric yellow on the other hand has absolutely no place in this recipe. Finally, the pan plays a role. A cast iron frying pan is a good candidate. You need something that can move from a hot oven to the stovetop. If it has a metal handle hang a tea towel on it when it comes out of the oven to remind you it’s hot. Everyone burns themselves once – it really hurts. 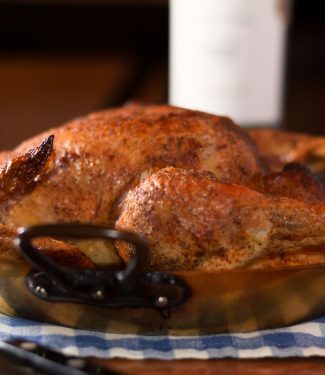 A good roast chicken is hard to beat. Add a pan sauce and you have a winner every time. Pre-heat oven to 400F. Pre-heat your roasting pan in the oven as it heats up. Untruss your bird and rub with olive oil. Season inside and out with salt and pepper. Place the chicken in the pre-heated pan (this sears the bottom of the bird and prevents the skin from sticking to the pan - most of the time). Continue roasting until the breast reads 165F and the thigh reads 175F. The thigh is almost certain to be done if the breast makes it to 165F. Remove the chicken from the pan. Tip the pan and carefully spoon off the clear chicken fat, making sure to leave all fond and any drippings in the pan. Drippings are the brown liquid hiding under the clear fat. Place the pan over medium heat. Deglaze with the white wine, making sure to melt all the wonderful fond you have created. Reduce the white wine until it is almost completely gone. Add 1/4 cup of chicken stock and scrape any caramelized goodness that accumulates on the sides back into the pan. Reduce by about half and add the second 1/4 cup of stock. If you are using the concentrated chicken stock add it now. When you get back to your chicken you will see some liquid has accumulated on the cutting board. Pour this into the sauce. When you start to carve up the chicken and it gives off more liquid pour this into the sauce as well. Reduce until you have a nice viscous sauce. This is a base recipe and you can go many different directions with it. Cut a lemon in half and put it in the cavity before you roast it. Squeeze the roasted lemons into the pan to deglaze instead of using white wine (catch the seeds). Follow the recipe from there. Pushing this a bit further, add some capers after the lemon – roast chicken piccata. Follow the recipe right to the end. Mix some dijon or pommery mustard with a bit of stock. Add 1/4 cup whipping cream to the sauce and then stir in the mustard mix. Replace salt and pepper with some creole or cajun seasoning. Add some finely chopped chipotle in adobo to the sauce at the end. Let your instincts guide you – almost anything works. 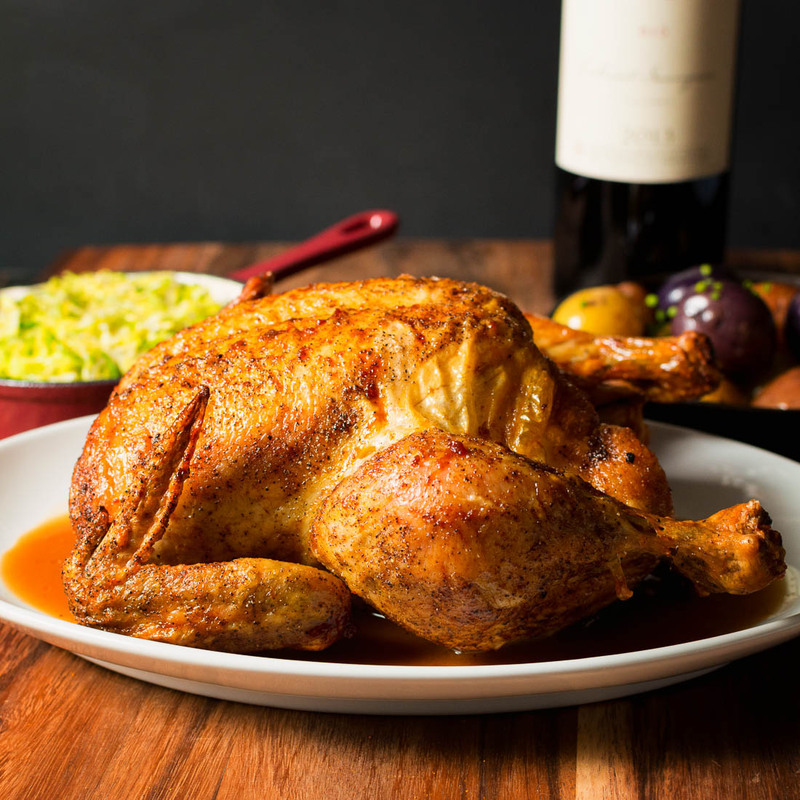 You’ve inspired me ~ my husband is ADDICTED to rotisserie chickens from the grocery store! This is a little more work than a grocery store rotisserie chicken but it’s totally worth it I think. That is one BEAUTIFUL roasted chicken! I love how simple and delish this recipe sounds, and the tip about the towel is a good one. I always forget that handle might be hot and nearly burn myself! I will have to try the towel next time. Thank you so much. If you have a chance to try making concentrated chicken stock that takes it right over the top! Your roast chicken is making my mouth water. What an amazing colour – I’m such as sucker for crispy Chicken skin! I always put half an onion and half a lemon and a bundle of herbs in the cavity when I roast a chook as that was what my Mum did. I like the half lemon and half onion approach too. There’s so many ways to roast a chicken! This recipe was UH-mazing. 2 successful recipes from a blog in a row? Definitely going to be a go to from now on. I’m so glad you liked it and that it worked out for you. She is an awesome promoter and chief food taster as well!